Edited and/or translated by D. L. Ashliman. Dolmens in Denmark, a collection of photographs. The Sigurd Portal. Carved doorposts of the medieval stave church at Hylestad, Setesdal, Norway. Although part of a Christian church, the carvings represent scenes from the heathen story of Sigurd the dragon slayer. 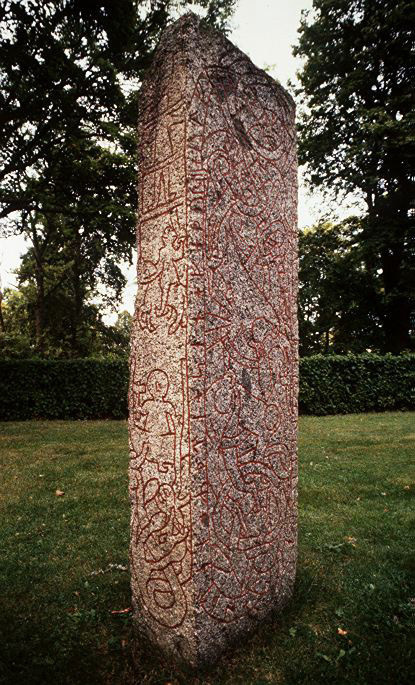 The Sigurd Runestone at Ramsundsberget, J?der, S?dermanland, Sweden. 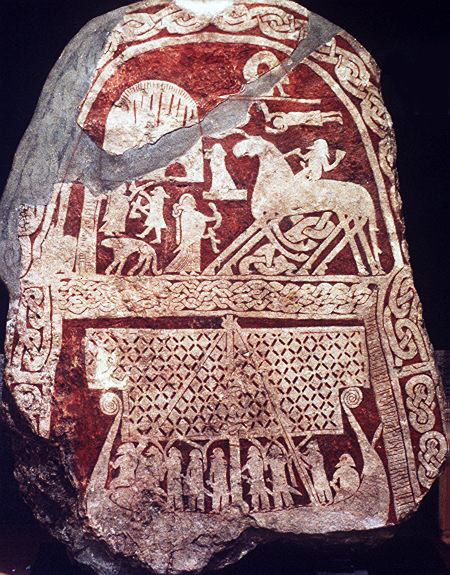 This famous runestone illustrates the story of how Sigurd kills the dragon Fafnir and his treacherous companion Regin. The Giant's Stone near Z?schen (Germany, Karl Lyncker). The Seven Stones of Morin (German, J. D. H. Temme). The Hun Graves at Z?ssow (Germany, J. D. H. Temme). Table-M?n: The Saxon Kings' Visit to the Land's End (England, Robert Hunt). Olaf's Mound and the Raised Stone at Slugan (Scotland, Lord Archibald Campbell). Runestones and Picture Stones from Scandinavia (a selection of photographs). A young man had seduced a girl under promise of marriage, and she proving with child, was deserted by him: The young man was called before session; the elders were particularly severe. Being asked by the minister the cause of so much rigor, they answered, "You do not know what a bad man this is; he has broke the promise of Odin." Being further asked what they meant by the promise of Odin, they put him in mind of the stone at Stenhouse, with the round hole in it; and added, that it was customary, when promises were made, for the contracting parties to join hands through this hole, and the promises so made were called the promises of Odin. It was said that a child passed through the hole when young would never shake with palsy in old age. Up to the time of its destruction, it was customary to leave some offering on visiting the stone, such as a piece of bread, or cheese, or a rag, or even a stone. The Odin stone, long the favorite trysting-place in summer twilights of Orkney lovers, was demolished in 1814 by a sacrilegious farmer, who used its material to assist him in the erection of a cowhouse. this misguided man was a Ferry-Louper (the name formerly given to strangers from the south), and his wanton destruction of the consecrated stone stirred so strongly the resentment of the peasantry in the district that various unsuccessful attempts were made to burn his house and holdings about his ears. Source: County Folk-Lore, vol. 3: Examples of Printed Folk-Lore Concerning the Orkney & Shetland Islands, collected by G. F. Black and edited by Northcote W. Thomas (London: Folk-Lore Society, 1903), p. 2. Principal Gordon of the Scots College at Paris in Arch?ologia Scotica, vol. 1, p. 263. Capt. F. W. L. Thomas in Arch?ologia, , vol. 34, p. 101. Daniel Gorrie, Summers and Winters in the Orkneys, 2nd ed. (London, 1869), p. 143. There was a custom among the lower class of people in this country which has entirely subsided within these twenty or thirty years. Upon the first day of every new year the common people, from all parts of the country, met at the Kirk of Stainhouse (Stennis), each person having provision for four or five days; they continued there for that time dancing and feasting in the kirk. The parties agreed stole from the rest of their companions, and went to the Temple of the Moon, where the woman, in presence of the man, fell down on her knees and prayed the god Wodden (for such was the name of the god they addressed upon this occasion) that he would enable her to perform all the promises and obligations she had and was to make to the young man present, after which they both went to the Temple of the Sun, where the man prayed in like manner before the woman, then they repaired from this to the stone [known as Wodden's or Odin's Stone], and the man being on one side and the woman on the other, they took hold of each other's right hand through the hole, and there swore to be constant and faithful to each other. This ceremony was held so very sacred in those times that the person who dared to break the engagement made here was counted infamous, and excluded all society. Source: County Folk-Lore, vol. 3: Examples of Printed Folk-Lore Concerning the Orkney & Shetland Islands, collected by G. F. Black and edited by Northcote W. Thomas (London: Folk-Lore Society, 1903), pp. 212-213. Black's source: George Low, A Tour through the Islands of Orkney and Schetland, containing Hints Relative to their Ancient, Modern, and Natural History, collected in 1774 (Kirkwall, 1879), p. xxvi. The "Temple of the Moon" is a circle of standing stones also known as the "Ring of Stennis." The "Temple of the Sun" is a circle of standing stones also known as the "Ring of Brogar." The general was transformed into a large stone which stands on a spot from which Long Compton is not visible, but on ascending a slight rise close to it, the town is revealed to view. Roger Gale, writing in 1719, says that whoever dared to contradict this story was regarded "as a most audacious freethinker." It is said that no man could ever count these stones, and that a baker once attempted it by placing a penny loaf on each of them, but somehow or other he failed in counting his own bread. A similar tale is related of Stonehenge. Source: James Orchard Halliwell-Phillipps, Popular Rhymes and Nursery Tales (London: John Russell Smith, 1849), pp. 193-194. Druidical circles and monoliths were looked upon with awe; and there were few that would have dared to remove them. Here is a tradition of a monolith on the farm of Achorrachin in Glenlivet. The farmer was building a steading, and took the stone as a lintel to a byre door. Disease fell upon the cattle, and most unearthly noises were heard during the night all round the steading. There was no peace for man or beast. By the advice of a friend, the stone was taken from the wall and thrown into the river that ran past the farm. Still there was no peace. The stone was at last put into its old place in the middle of a field. Things then returned to their usual course. The stone stands to the present day in the middle of the field, and in some of its crevices were seen, not many years ago, small pieces of mortar. Source: Walter Gregor, Notes on the Folk-Lore of the North-East of Scotland (London: Folk-Lore Society, 1881), p. 115. In the forest near Fulda there is a stone with many furrows. It was there that Frau Holle cried such bitter tears over her husband that it softened the hard stone. Source: J. W. Wolf, Hessische Sagen (G?ttingen and Leipzig: Dieterichsche Buchhandlung, 1853), p. 10. That the country of Denmark was once cultivated and worked by giants, is attested by the enormous stones attached to the barrows and caves of the ancients. Should any man question that this is accomplished by superhuman force, let him look up at the tops of certain mountains and say, if he knows, what man has carried such immense boulders up to their crests. For anyone considering this marvel will mark that it is inconceivable how a mass, hardly at all or but with difficulty movable upon a level, could have been raised to so mighty a peak of so lofty a mountain by mere human effort, or by the ordinary exertion of human strength. But as to whether, after the deluge went forth, there existed giants who could do such deeds, or men endowed beyond others with bodily force, there is scant tradition to tell us. But, as our countrymen assert, even today there are those who dwell in that rugged and inaccessible region to the north who, by the transformable nature of their bodies, are granted the power of being near or distant, and of appearing and vanishing in turn. The approach to this region, whose position and name are unknown, and which lacks all civilization, but teems with peoples of monstrous strangeness, is beset with perils of a fearful kind, and has seldom granted to those who attempted it an unscathed return. Source: The First Nine Books of the Danish History of Saxo Grammaticus (Gesta Danorum), translated by Oliver Elton (London: David Nutt, 1894), pp. 12-14. Slightly revised. Saxo's Gesta Danorum (The Deeds of the Danes) was written ca. 1208. Enormous stones, similar to those described by Saxo, can still be seen in the many dolmens still extant in Denmark. The inhabitants of the little town of Naumburg, near the border of the Waldeck District, built a church for the praise of God and and the salvation of their souls, for there was not yet one at that place. The devil, from a vantage point on a mountain near Z?schen watched angrily as the pious work progressed from day to day. Finally he could no longer contain his anger; he picked up a huge stone, wanting to throw it at Naumburg. However, it got caught on his sleeve and fell into a field between Z?schen and Naumburg. The Evil One went there, sat down on the stone, and wept bloody tears because of his failed throw. The stone is still there, and is known by the name Riesenstein (Giant's Stone). You can still see where the devil sat and the three red stains which are said to have come from his bloody tears. Source: Karl Lyncker, Deutsche Sagen und Sitten in hessischen Gauen (Kassel: Verlag von Oswald Bertram, 1854), p. 263. Naumburg and Z?schen lie about 30 km west of Kassel in central Germany. Stolzenhagen Field is under the jurisdiction of M?llenbeck in Mittelmark and is not far at all from Lake Wandelitz. In this field there is an enormous stone which extends several feet beneath the earth and which has the imprint on its top of a very large and powerful man's hand. The five fingers can still be recognized clearly and distinctly. The people of Wandelitz relate that in ancient times this stone lay on the other side of Lake Wandelitz. An enormous giant lived there, and in order to prove his strength he picked up the stone, pressed his five fingers into it -- leaving their imprint -- and then threw it across the lake. Source: J. D. H. Temme, Die Volkssagen der Altmark. Mit einem Anhange von Sagen aus den ?brigen Marken und aus dem Magdeburgischen (Berlin: In der Nicolaischen Buchhundlung, 1839), p. 99. Not far from the town of Morin in Neumark there are seven stones standing together in a field. They are called simply "the Seven Stones." According to legend they are seven young men who wantonly moistened their bread and cheese there in an indecent manner. As punishment for this wickedness, they were immediately turned into stones. Source: J. D. H. Temme, Die Volkssagen der Altmark. Mit einem Anhange von Sagen aus den ?brigen Marken und aus dem Magdeburgischen (Berlin: In der Nicolaischen Buchhundlung, 1839), pp. 99-100. Near Wirchow in Neumark there is a circle of eighteen large stones. Fourteen of them are between two and two and a half feet high, and they stand in pairs, forming a large circle around two other stones, which stand in the middle of the circle. These two are more than two yards high. Two additional stones, still somewhat taller, stand outside the circle some distance removed. About the origin of these stones it is related that at this place several hundred years ago a number of people gathered on Holy Whitsunday to carry out a naked dance. As special punishment for their wicked behavior they were turned into stones. Thus the stones are called "the Adam's Dance," or "the Stone Dance." The fourteen stones in the circle were the male and female dancers. The two in the middle were the beer servers, and the two outside the circle were the musicians. One can still see violins on these latter ones. Source: J. D. H. Temme, Die Volkssagen der Altmark. Mit einem Anhange von Sagen aus den ?brigen Marken und aus dem Magdeburgischen (Berlin: In der Nicolaischen Buchhundlung, 1839), p. 100. Whitsunday (Pentecost) is the seventh Sunday after Easter, and marks the close of Eastertide. Numerous non-Christian springtime rituals, superstitions, and practices have attached themselves to Whitsuntide. Ages ago there were two large, ancient Hun Graves on the Buggenhagen Estate at Z?ssow. In the year 1594 the people of Greifswald needed stones for a building, and upon their request the Buggenhagens gave them permission to take the stones from the two Hun graves. After the Greifswald stonemasons had cut up the large stones they became curious about what might be buried in the earth beneath them. They therefore began to dig into one of the graves, where they found many human corpses. They were completely preserved and enormously large. They measured between eleven and sixteen feet in length, and they all lay in a row. Between each one there was a jar filled with earth. When they began digging into the second grave they heard a great commotion beneath the earth, as though people were dancing and rattling bunches of keys. This so frightened them that they ceased their digging. Source: J. D. H. Temme, Die Volkssagen von Pommern und R?gen (Berlin, In der Nicolaischen Buchhandlung, 1840), no. 173, p. 213. North Germans refer to the giants that formerly occupied their land as H?nen, a word that is etymologically related to the Hunnen (Huns), of central Asia. Greifswald is in northeast Germany. At a short distance from Sennen church, and near the end of a cottage, is a block of granite, nearly eight feet long, and about three feet high. This rock is known as the Table-m?n, or Table-main, which appears to signify the stone-table. At Bosavern, in St. Just, is a somewhat similar flat stone; and the same story attaches to each. Sigebert, 5th king of the East Angles, -- all who flourished about the year 600. At a point where the four parishes of Zennor, Morvah, Gulval, and Madron meet, is a flat stone with a cross cut on it. The Saxon kings are also said to have dined on this. The only tradition which is known amongst the peasantry of Sennen is, that Prince Arthur and the Kings who aided him against the Danes, in the great battle fought near Vellan-Drucher, dined on the Table-m?n, after which they defeated the Danes. Source: Robert Hunt, Popular Romances of the West of England; or, The Drolls, Traditions, and Superstitions of Old Cornwall (London: John Camden Hotten, 1871), pp. 180. In the western part of Cornwall, all the marks of any peculiar kind found on the rocks are referred either to the giants or the devil. In the eastern part of the county such markings are almost always attributed to Arthur. Not far from the Devil's Coit in St. Columb, on the edge of the Gossmoor, there is a large stone upon which are deeply impressed marks, which a little fancy may convert into the marks of four horseshoes. This is "King Arthur's Stone," and these marks were made by the horse upon which the British king rode when he resided at Castle Denis, and hunted on these moors. King Arthur's bed, and chair, and caves, are frequently to be met with. The Giant's Coits, -- and many traditions of these will be found in the section devoted to the giant romances -- are probably monuments of the earliest types of rock mythology. Those of Arthur belong to the period when the Britons were so far advanced in civilization as to war under experienced rulers; and those which are appropriated by the devil are evidently instances of the influence of priestcraft [Roman Catholicism] on the minds of an impressible people. Source: Robert Hunt, Popular Romances of the West of England; or, The Drolls, Traditions, and Superstitions of Old Cornwall (London: John Camden Hotten, 1871), p. 186.
Who that has traveled into Cornwall but has visited the Logan Stone? Numerous Logan rocks exist on the granite hills of the county, but that remarkable mass which is poised on the cubical masses forming its Cyclopean support, at Trereen, is beyond all others "The Logan Stone." A more sublime spot could not have been chosen by the Bardic priesthood for any ordeal connected with their worship; and even admitting that nature may have disposed the huge mass to wear away, so as to rest delicately poised on a pivot, it is highly probable that the wild worship of the untrained tribes, who had passed to those islands from the shores of the Mediterranean Sea, may have led them to believe that some superhuman power belonged to such a strangely balanced mass of rock. Nothing can be more certain than that through all time, passing on from father to son, there has been a wild reverence of this mass of rock; and long after the days when the Druid ceased to be there is every reason for believing that the Christian priests, if they did not encourage, did not forbid, the use of this and similar rocks to be used as places of ordeal by the uneducated and superstitious people around. Hence the mass of rock on which is poised the Logan Stone has ever been connected with the supernatural. To the south of the Logan Rock is a high peak of granite, towering above the other rocks; this is known as the Castle Peak. No one can say for how long a period, but most certainly for ages, this peak has been the midnight rendezvous for witches. Many a man, and woman too, now sleeping quietly in the churchyard of St. Levan, would, had they the power, attest to have seen the witches flying into the Castle Peak on moonlight nights mounted on the stems of the ragwort (Sen?cio Jacob?a Linn. ), and bringing with them the things necessary to make their charms potent and strong. This place was long noted as the gathering place of the army of witches who took their departure for Wales, where they would luxuriate at the most favored seasons of the year upon the milk of the Welshmen's cows. From this peak many a struggling ship has been watched by a malignant crone, while she has been brewing the tempest to destroy it; and many a rejoicing chorus has been echoed, in horror, by the cliffs around, when the witches have been croaking their miserable delight over the perishing crews, as they have watched man, woman, and child drowning, whom they were presently to rob of the treasures they were bringing home from other lands. Upon the rocks behind the Logan Rock it would appear that every kind of mischief which can befall man or beast was once brewed by the St. Levan witches. Source: Robert Hunt, Popular Romances of the West of England; or, The Drolls, Traditions, and Superstitions of Old Cornwall (London: John Camden Hotten, 1871), pp. 329-330. Touch a Logan stone nine times at midnight, and any woman will become a witch. A more certain plan is said to be to get on the Giant's Rock at Zennor Church-town nine times without shaking it. Seeing that this rock was at one time a very sensitive Logan stone, the task was somewhat difficult. Source: Robert Hunt, Popular Romances of the West of England; or, The Drolls, Traditions, and Superstitions of Old Cornwall (London: John Camden Hotten, 1871), p. 321. The Norwegians once made a sudden descent from their ships on the lower end of Craignish. The inhabitants, taken by surprise, fled in terror to the upper end of the district, and halted not until they reached the Slugan (gorge) of Gleann-Domhuinn, or the Deep Glen. There, however, they rallied under a brave young man, who threw himself at their head, and slew, either with a spear or an arrow, the leader of the invaders. This inspired the Craignish men with such courage that they soon drove back their disheartened enemies across Barbreck river. The latter, in retreating, carried off the body of their fallen leader, and buried it afterwards on a place on Barbreck farm, which is still called D?nan-Amhlaidh, or Olav's Mound. The Craignish men also raised a stone at Slugan to mark the spot where Olav fell. Source: Lord Archibald Campbell, Waifs and Strays of Celtic Tradition, Argyllshire Series, vol. 1 (London: David Nutt, 1889), pp. 11-12. Campbell's title for this piece is "The Battle between the Craignish People and the Lochluinnich Norwegians at Slugan." Picture stone discovered at Stora Hammars, L?rbro, Gotland, Sweden. It is now kept at the Statens Historiska Museet at Navavagen, Sweden. The scenes on the stone cannot be identified with certainty. Picture stone found at Tj?ngvide on the Swedish island of Gotland. This stone is now kept at the Statens Historiska Museet at Navavagen, Sweden. 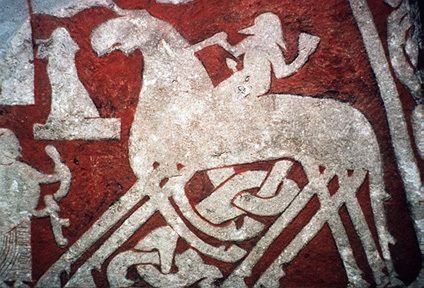 The top scene shows Odin astride his eight-legged horse Sleipnir approaching Valhalla. The bottom scene depicts a Viking warship. 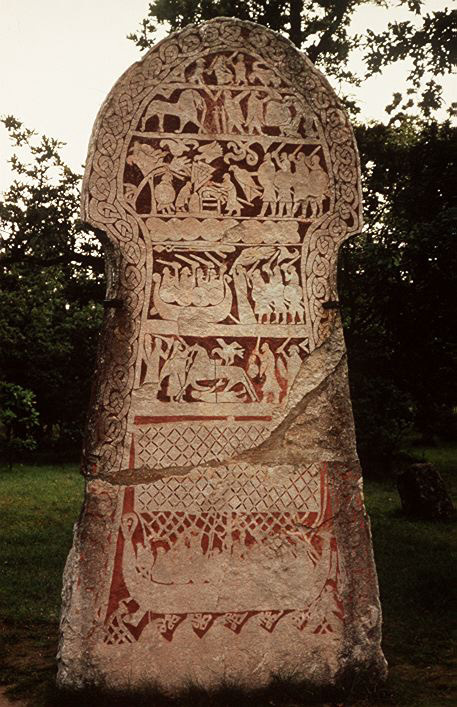 Runestone at Altuna, Uppland, Sweden. The scene at the bottom of the stone's narrow face depicts Thor, his feet protruding from a boat, capturing the Midgard Serpent. Ancient Sites: Newgrange, a description of the megalithic tomb Newgrange in Ireland. Dolmens in the Netherlands, well organized information, including photographs and drawings, of the 5000 year old dolmens in Drenthe, Netherlands. Faldouet Dolmen, or La Pouquelaye de Faldouet, one of the so-called "fairy stones" on the Island of Jersey. Megalith, a home page, with German text, for megalithic sites in Europe, especially Germany. Stonehenge....The Truth? Information about and high quality photographs of Europe's most famous ancient stone monument. Stone Pages, an excellent resource (from a server in Italy) organized by Paola Arosio and Diego Meozzi and describing megalithic monuments in England, Ireland, and Scotland. The World of the Vikings: Runes. An excellent starting point for a WWW study of rune typology, rune stones, and related topics. Yahoo index for Science:Anthropology and Archaeology:Archaeology:Megaliths. The University of Pittsburgh course German 1500.